At the start of the 20th century, when the demand for reed organs was diminishing, Estey began to manufacture pipe organs. By the time the company closed in 1960, Estey had produced and installed over 3,000 pipe organs in churches and auditoriums across the country. The Estey Organ Museum has a number of small Estey pipe organs installed in the Engine House Gallery. 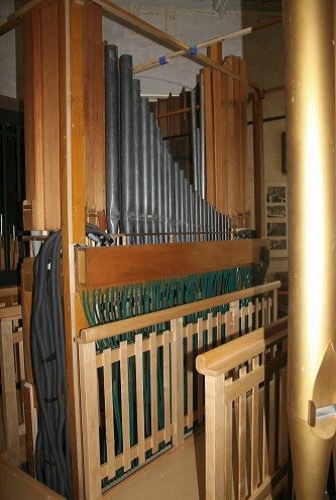 A number of larger Estey pipe organs can be found in churches throughout Brattleboro. 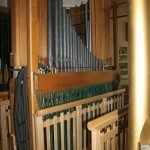 The website esteyorgan.com provides a directory of Estey pipe organs installed in the Brattleboro area. Our pipe organ collection includes a beautiful instrument, Opus 1814, with highly decorated pipes, built in 1920 for the First Baptist Church, Brewton, AL. 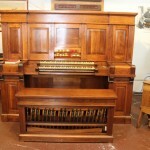 A grand Estey Upright Minuette is our latest pipe organ acquisition. This organ was once owned by Fred Feibel, an organist at the New York Paramount Theatre, and conserved by Joseph and Virginia Vanore, founding members of the Garden State Theatre Organ Society. 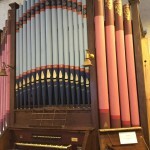 An Estey pipe organ from 1915 (Opus 1347, Universalist Church, Hinsdale, NH) has been adapted to allow museum visitors to walk through its otherwise hidden mechanisms and observe how a pipe organ works.